Can Epic do Chair Entertainment's million-selling games justice? Thus far, it's a resounding yes. 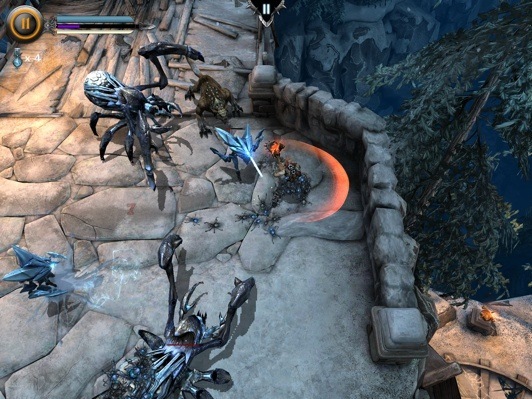 Collective sigh of relief: Infinity Blade Dungeons is a lot of fun, but was there any doubt? Series creator Chair Entertainment wisely handed the development reigns to Epic Games, which has a list of critically acclaimed smash hits to its credit. The result is a game that plays similar to Blizzard's Diablo (without question a great thing), but has just enough personality and hammer-smashing goodness to make it unique. 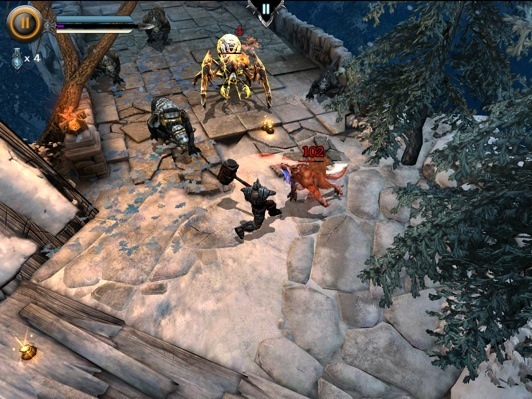 On that note, you can forget about the one-on-one battles the series is famous for, as well as hero Siris, who gained a much-needed personality boost in Infinity Blade 2. Instead, you play as the apprentice to the master of the forge, a weapon-swinging brute who, over time, must ace the art of crafting weapons to eventually design the Infinity Blade, the all-powerful sword the God King was so unwilling to part with in the original Infinity Blade. As for the exploration element, the game features an isometric/overhead perspective, with you poking different parts of the screen and watching the apprentice move to those exact locations. To that end, there are plenty of wooden crates and boxes to break, along with rather large treasure chests that more often than not yield sacks of gold and other valuable items, used to purchase weapons and armor. Combat, meanwhile, involves multiple enemies and types, ranging from spiders great and small to werewolves and one pissed off bear, among others. These beasties appear from all angles and attack at once, quickly tearing chunks from the apprentice's health bar. Thankfully, you can return the favor through gestures along the touch screen. Swiping an enemy instructs the character to attack, and you can even press and hold the apprentice, then paint targets (two for now). From there, sit back and watch him go to work. In addition, double tapping enemies causes the apprentice to leap into the air and bring his selected weapon down upon their heads, while encircling him whips the warrior into a frenzy, resulting in a cool spin attack. Have to admit, causing this destruction is both easy and quite satisfying. Then, during your travels, you'll happen upon bits of rock that you're free to mine (prepare for the resulting tap mini game), gathering bits or iron, copper and other materials later used to forge different weapons. Yes, Epic Games somehow made blacksmithing enjoyable, as you tap to hammer the resulting piece of metal, then furiously rub away blemishes before sinking it into the fire. Screw up, and the axe/sword won't be nearly as useful. Succeed, and monsters will have something to fear. Of course, it wouldn't be Infinity Blade without boosting the character's stats. That said, expect to level him up using gems and skill points, transforming the apprentice into a ruthless killer. 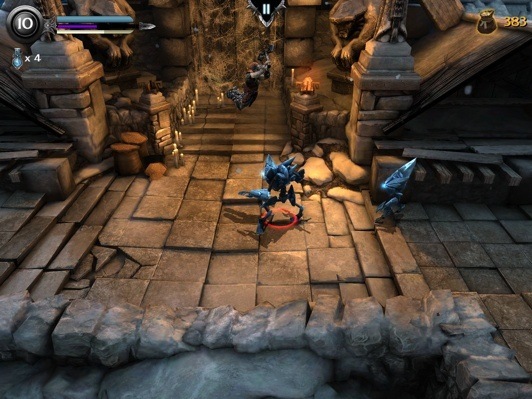 All told, we're impressed with Infinity Blade Dungeons. Thus far, Epic managed to take Chair's baby in a cool direction, one that should please fans and help extend this million-selling franchise while helping to make the wait for Infinity Blade 3 that much easier. No release date is set, but you can expect to kick open chests and bash spiders later this year.